In celebration of our 6 month anniversary, Brookfieldangler.com is proud to present its first ever giveaway contest! 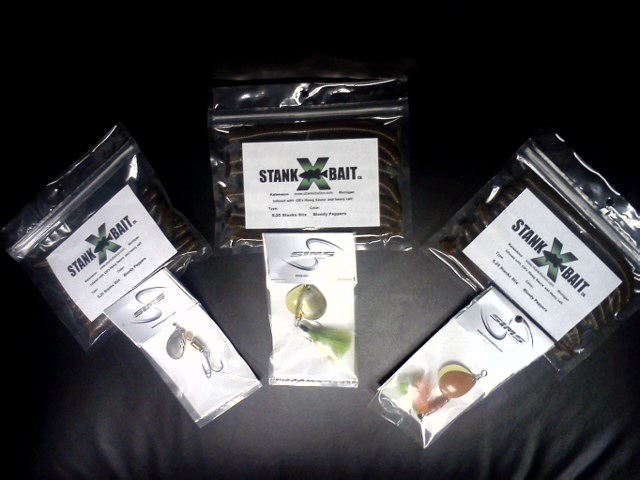 This give away is sponsored by Sims Spinners and Stank X Bait Company. We will be giving away prizes to three lucky people. Read below to find out what you have to do to win! 1. One prize will go to a lucky follower on the site who comments on this post. If you aren't a follower yet, be sure to hit the "Follow" button and make a comment on this post! 2. One prize will go to one lucky Facebook fan that comments on the link to this post! If you aren't a fan yet, head over to the Brookfieldangler facebook page and hit "like" and leave a comment on the link! 3. Finally, one prize will go to the person who comes up with best name for my latest catch, which can be found here Leave a comment on that post with your idea for a name and I will select the winner! Prize two is a package of StankX Stix - 5.25" - Bloody Peppers and Sims Spinners #4 1/2oz Double Blade inline spinner with fire tiger skirt, orange body, one yellow blade, and one orange blade. Prize three is a package of StankX Stix - 5.25" - Bloody Peppers and Sims Spinners #4 1/2oz Double Blade inline spinner with fire tiger skirt, orange body, one yellow blade, and one brass blade. Contest ends on July 15th, with winners announced on the 16th, so get your entries in and be sure to start following and liking! Good luck and thank you to all of our fans and sponsors of this contest!! I'm in. I am a follower of the site and have been wanting to try both stankx and sims. This is Tom by the way but I still have that little issue which is hopefully on its way to being resolved!!!! I should really be doing some work right now!!!!! ooh pick me, pick me! So trying to figure this out!!! OMG, I think we got it. That was a tough one to get but I can now post. It's a June 30th miracle! Cool site, cool baits. Congrats on your 6mo anniversary! Im in i'm a believer.